I told my family that I was going to be a lawyer when I was ten years old. After graduating from high East Grand Rapids High School, I went on to graduate from Michigan State University — and then Wayne State Law School, never wavering from that goal. The goal was never to be a rich or a powerful attorney. My goal was to help people solve problems. 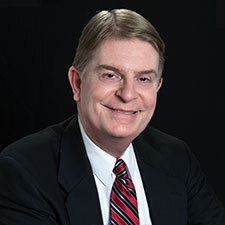 Practicing in Grand Rapids for thirty-five years, I’ve achieved my goals by practicing law in areas including family law, real estate, probate and estate planning. I have also handled cases involving contract disputes, receiverships and business start-ups. I’m proud of my work as a lawyer, especially being recognized with two awards for the legal services that I’ve provided to the less fortunate in our community, the Michael Barnes Award from the Grand Rapids Bar Association and the John Cummiskey Award from the State of Michigan Bar Association. Over my career, I believe that I have helped literally hundreds of people resolve a dispute or better organize their lives through law. I have worked hard to achieve the respect of my colleagues and that of the judges and referees throughout West Michigan. I am very proud of my beautiful wife, Kim, who is a skilled therapist at Pine Rest Christian Mental Health Services and of our three adult children, Stephanie, Zachary and Alec. For more information about attorney Steven Williams at The Britt Law Group, please contact him here or call him directly at 616.866.2700.